Tom Hanks and wife Rita looked very loved up. Source: Getty. He’s starred alongside some of Hollywood’s leading ladies, but Tom Hanks only has eyes for one woman – and he looked as smitten as ever as he enjoyed a night out with his glamorous wife Rita Wilson on Friday. The actor, 62, flashed a huge smile as he embraced Rita at the American Friends of Blerancourt Dinner at Colony Club in New York, sharing a kiss in front of their friends and appearing as in love as ever. Rita stole the show once again as she showed off her figure in a tight scarlet red-coloured floor-length ball gown, with a one-shoulder neckline. She added a beautiful diamond necklace to her outfit and carried a stylish black clutch bag. Tom Hanks and Rita Wilson made a very glam couple. Source: Getty. Wearing her long hair in loose waves over her shoulders, the star, also 62, looked a million dollars as she posed arm in arm with her famous husband. Tom meanwhile looked smart and dapper in a dark suit with a large poppy to honour Remembrance Day this weekend. 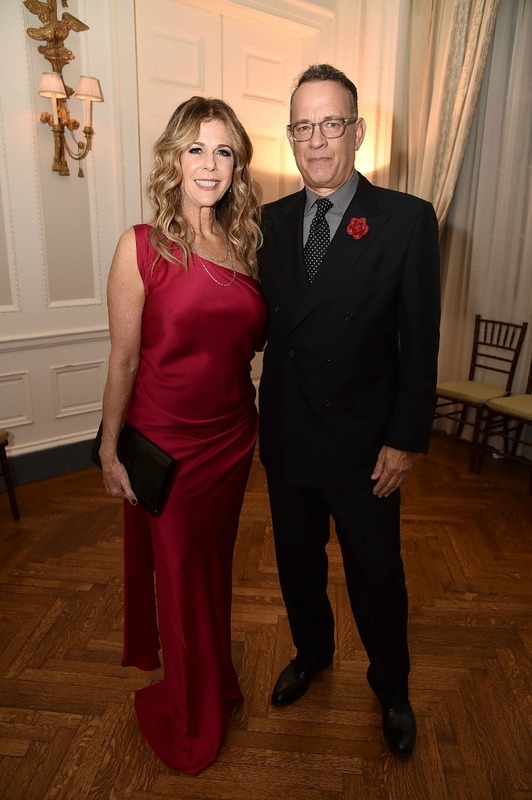 Do you like Rita Wilson’s dress?